Traditional and family-run hotel in Eisacktal, only 15 minutes by car from the city of Brixen. Welcome to Hotel Torgglerhof*** in St. Andrä near Brixen! 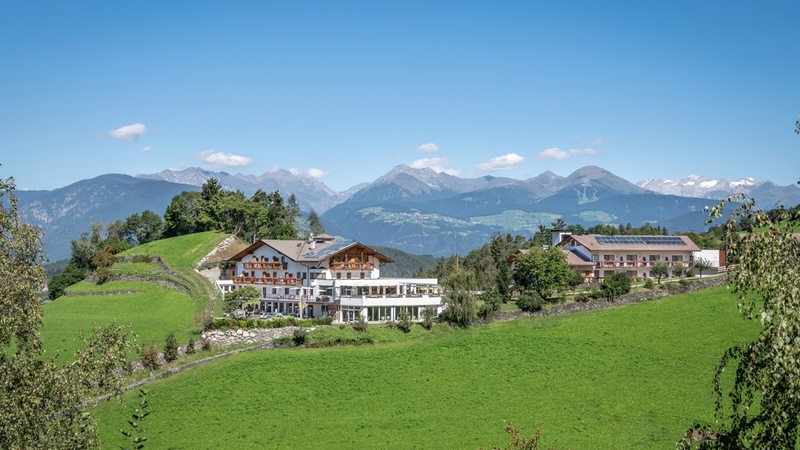 The family-run Hotel Torgglerhof*** is situated in a dreamlike panoramic position in St. Andrä near Brixen. Embedded in the wonderful landscape of Eisacktal, our house is the ideal starting point for activities at any season. Hearty South Tyrolean hospitality, a comfortable ambiance and individual service will make your holidays in St. Andrä a very special experience. Our guests are offered comfortable and inviting rooms, which are equipped with shower/WC, phone, TV, safe, hairdryer and balcony. Available as well are a playroom and a children’s playground. In our new apartment houses (3 and 4 km from the hotel), we offer spacious apartments for 2-6 persons. They are equipped with any comfort and offer complete furnishings. In the wood-panelled dining rooms with typical Tyrolean stoves, we serve a rich breakfast in the morning as well as South Tyrolean specialities, Italian and international dishes, accompanied by suitable wines. Relaxation seekers are offered our spa area with indoor pool, whirlpool, various saunas, Kneipp basin, solarium, relaxation area and fitness room. The surrounding area of our Hotel Torgglerhof in St. Andrä is a paradise for families and active vacationers. In summer, the idyllic landscapes is perfect for magnificent hikes and bike tours. In winter, you can reach the lift facilities of Plose skiing are within a few minutes with the ski shuttle. Cultures lovers will look forward to a visit in the cities of Klausen, Brixen and Sterzing at any season. 70m2 and 50 m2 terrace South-west terrace, kitchen with dishwasher, microwave oven, hotplate, toaster, coffee machine, dish/dishcloths, corner sitting area, pull-out couch, flat screen (SAT - TV) and wireless LAN connection, room with double bed, safe, bed linen, bath with shower/WC, bidet, bathtub, hand and bath towels and hair dryer. 40m2 and 10m2 south-west facing balcony (3 km away from the Hotel Torgglerhof) Close to St. Andrä village center (5 min walk from the gondola lift or shops). In front of the apartment house is a small public playground, and at the Plose mountain station a larger playground with the exciting family hiking trail WoodyWalk. South-west balcony, kitchen with dishwasher, microwave oven, hotplate, toaster, coffee machine, dish/dishcloths, corner sitting area, pull-out couch, flat screen (SAT - TV), room with double bed, safe, bed linen, bath with shower/WC, bidet, hand and bath towels and hair dryer. Brixen in South Tyrol is the convincing symbiosis of the oldest city in Tyrol with its charming alleys and lively city centre, the surrounding romantic holiday villages and the mountain Plose. Brixen is the number one rewarding bike hotspot for mountain bikers south of the Brenner Pass. Top performance and top pleasure! The very big cinema in the Brixen mountain summer! What do you need to experience fun and action on your bike?